These spicy slow cooker pot roast tacos are an easy dinner to make. The pot roast cooks all day in your slow cooker so you can come home to an easy dinner. When I originally set out to create this dish, I knew I wanted to offer something easy for busy families to put together. I don’t know about you, but this school year has been absolutely crazy between both of my kids’ sports activities…not to mention huge homework loads. Today is the last day of JV volleyball and we should slowly get our evenings back, for two months before club season starts. I really do enjoy that our daughter loves volleyball so much…but after 3 1/2 months of 5 days a week volleyball, it will be nice to sit down for a family meal again :-). Our slow cooker is about to become my best friend has been our best friend through all of the busy nights. Dinner can’t get any easier than tossing meat, spices, leeks, sweet potatoes, RO*TEL and Hunt’s Diced Tomatoes into a crock pot set on low all day. By the time we are all home, dinner is ready. Slow roasting all day long makes this meat incredibly tender. This slow cooker recipe is so easy. I love dumping in the ingredients. No prep work is needed. To get everything I needed to make this dinner, I headed to our local Walmart in San Jose. Walmart is getting more and more gluten free foods into their store and I couldn’t be happier. Hello affordable gluten free! Aisles are clearly labeled and it is so easy to find what you need. I like the spicier original RO*TEL for this recipe, but they make a mild version as well if you don’t want your meat spicy in this dish. By using these canned tomatoes and fresh sweet potatoes and leeks, this dish is both delicious and healthy. I put the roast, leeks, cumin, salt and pepper into the crock pot. Add the RO*TEL and Hunt’s Diced Tomatoes on top. 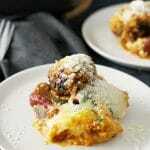 Drizzle a little olive oil, add cut up sweet potatoes, and 1/2 cup of water. Cover and set the temperature to low. When you get home, all you need to do is put out some taco fixings and you’re ready to serve dinner. For more delicious gluten free dinner ideas…go here. If you love tacos, you will also want to try Dishin Delish’s Slow Cooker Carne Asada Tacos. 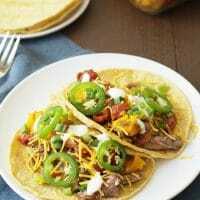 Easy slow cooker pot roast recipe for tacos. Turn on a slow cooker on low. Add meat, spices, RO*TEL, diced tomatoes, sweet potatoes, leeks, and olive oil into the crock pot. Set up tortillas and taco fixings. This sounds like a quick, easy and very delicious meal idea. 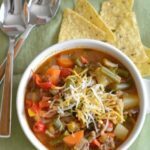 I am also a mom of kids with busy schedules, so this recipe is so perfect for a weeknight meal for my family! I love Pot Roast already, but combining it in a taco is genius! I love cooking with the slow cooker. The spicy pot roast tacos would be something that my family would love. Great recipe. These tacos look so delicious! I’ll take two! I love spicy food and these tacos look like they have just the right kick. Yum! These look delicious – Love the idea of slow roasted meat in a taco! WE love tacos here…in fact that is what my husband asked me to make for his birthday celebration. Using the crock pot makes things so easy and tasty. Can never go wrong with a good taco. Thank you Adriana…I need to use my crock pot more often.